The Happy Homebodies: Cutest Bike Basket. Pardon this short interruption from the home decor posts, but I am on a bit of a bike kick right now. We've been riding so much ever since we got the new bikes. How cute is my new vintage style bike basket?! Of course I don't think $40 is cheap, but I shopped it around and couldn't find it for less anywhere! Apparently Nantucket has this market covered, and $40 is the standard price. I did consider a DIY version (random basket zip-tied to bike?) 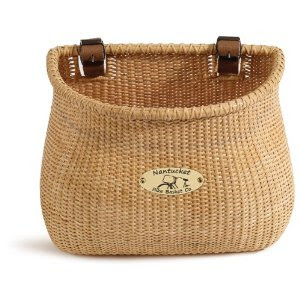 but I decided to just use my birthday money to buy myself this adorable basket. It's very good quality and I feel like I got a good value for the money, which is what matters at the end of the day. Plus I just love the unique shape of the basket! I attempted to make a go of it with the seat that came with my Schwinn, but my bum just wasn't having it. 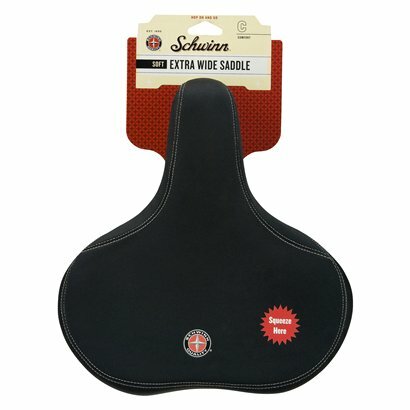 I bought this Schwinn Ultra Comfort Bike Seat at Target, and it was a total game changer! If you're not comfortable, you won't ride very often. That defeats the point of having the bike. Get the squishy seat. Your bum will thank you, I promise. I didn't really buy into the husband's claims that riding bikes would be an excellent workout, but now I'm a believer. It's a fun way to burn some calories, and it saves money on gas if you do things like we did and use your bike to pick up pizza or groceries. Plus it's good for the environment!